Bialya remains in ruins from Black Adam's attack. Clark Kent interviews the president, trying to persuade him to accept aid, but he refuses. Bruce Wayne speaks with Kent, on his way via plane. At the food relief center, a gentleman with a moustache and a sour look bellows to a man named Hussein. It's indicated through a quote that this is Yuurd the Unknown, also known as Famine. A man in a head wrapping talks to his lieutenant about being greeted as liberators (presumably for an invasion of Bialya). He is, through caption, inferred to be Rogga of the Seven Atrocities, AKA War. Clark and Wayne meet, planning to take down Taylor Reese, the man with the moustache and the sour look, for misappropriating relief aid. Reese has been funneling aid out through Hussein. A nurse chastises a relief doctor who is taking too many breaks and ignoring his duty. This man is indicated to be Zorrm the Desolate, AKA Pestilence. On Oolong Island, Veronica Cale is taking charge of operations. She's gearing up the old works for... something. At her apartment, she negotiates with an ambassador to get Oolong recognized as a sovereign nation. Cale recalls unleashing the Four Horsemen, and watching World War 3. 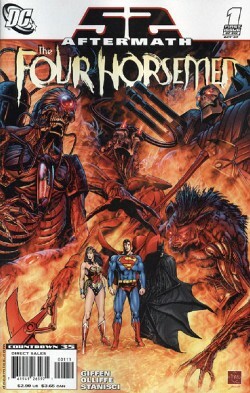 Wonder Woman appears, and Cale taunts her with diplomatic immunity before indicating that she desires to destroy the Four Horsemen. At his computer, Reese watches Clark Kent banter with Jack Ryder about the situation on the ground. All around him, there are dead bodies splattered everywhere. Bruce arrives, and Mr. Reese stands, his eyes glowing, and turns his power on Bruce, who flees. The assembled security are easily decimated by Reese, who shrugs off bullets and attacks Wayne. Wayne whispers for Superman, who appears, pulling Reese off Wayne. Reese bites Superman, and flees as Wayne and Superman take care of fighting Security personnel. Bruce Wayne tells Superman he felt like he could eat anything when Famine turned his powers on him, and they conspire to deal with the Horsemen. Bruce indicates he's called in Checkmate. In a burned out slum, a man looking near death is indicated to be Azraeuz, AKA Death. Actually, all that aside, this book has my attention, and deservedly so, for a number of reasons. The plot is actually very simple and paced well. It's introduced all of the mains, established the dilemma, and has Supes and Bats working together against a real and palpable threat, a group of Apokaliptian (sp?) demi-gods about to assume Earthly form. Not bad, there. It feels a lot like 52, and it should, given the penciller and the writer, and it has the character of 52. I held it out, after reading it, and said, "Is this DC right now?" I like the idea of the Horsemen taking human form, I like the ensuing mystery, and I like the fact that the big three are directly involved. I LOVE seeing Clark Kent acting like a reporter again, for once, and a capable one, making real change. The only thing that conflicted me in the whole story, and I don't even know if I'm conflicted until I see how it plays out, is the use of Veronica Cale. Cale was originally going to be a "Lex Luthor" for Wonder Woman, and then became the woman who unleashed the Four Horsemen on Oolong. It perplexed me, because as her story built in Wonder Woman it was fairly abruptly cut off when Rucka was taken off the book and the new team put on in the wake of Infinite Crisis. Cale was never seen again until 52, and here she is, establishing a Dr. Doom style oasis on Oolong. So why am I conflictedesque? Well, if she becomes a one-note Dr. Doom clone when she had such character, such potential as a Wonder Woman foible, that'd be too bad. BUT, given so far, given the attention to character, I have hopes that this story could make Cale a vital part of the DCU again, and perhaps set her directly in line for a Wonder Woman rivalry once DC gets their heads out of their nethers, cans the current Wonder Woman scribes, and puts someone in there who knows her character and doesn't think it'd be cool to just throw a bunch of emasculating wenches into DC and have them cut the heads off patriarchal figures. Nah, that's not a guy writing the subtleties of feminism or strong female characters, is it? This story has me, and I'm eager to see where it goes. Art - 5: Fine work. I loved it in 52, and it's still great here. The scene with the bodies in Reese's office is chilling, and all of the characters are very distinctive. The pages all pop with detail, and I remain a fan of this work. Cover Art - 5: I would have looked at this book at the shop had I not been reviewing it. This cover would have sold it. A great, beautiful, detailed depiction of the big three around the symbolic threat, with great coloring. Fantastic cover.